The PCA is an old vessel, in fact emerging in the lower species prior to development of the MCA. This makes sense because some of the areas it supplies — occipital and mesial temporal lobes (besides the tectum) — are phylogenetically more well established than the bulk of frontoparieral areas now served by the MCA. 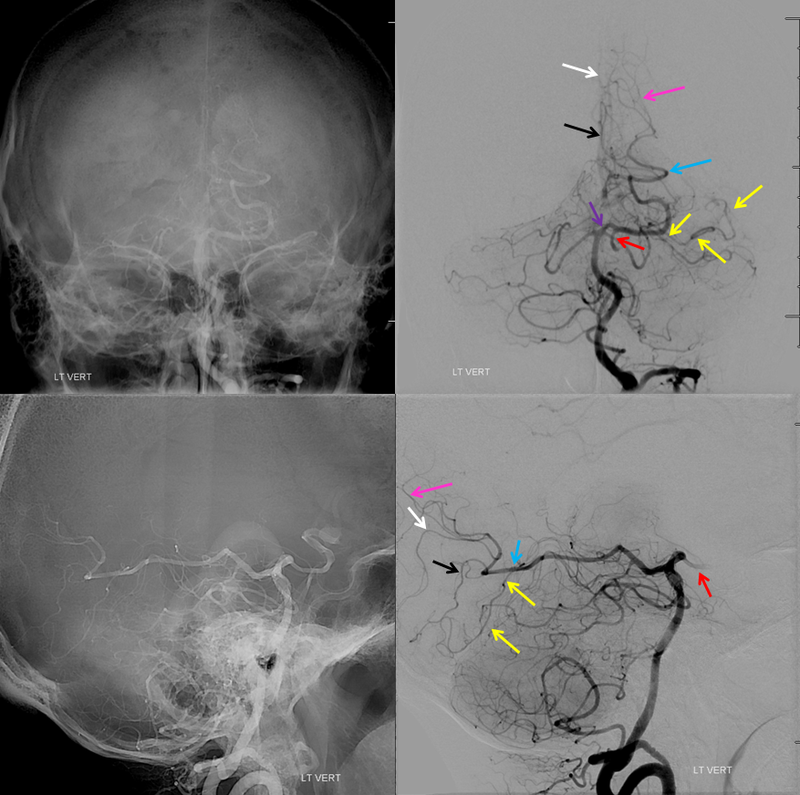 The PCA originally belongs to the anterior, carotid circulation, arising as the carotid terminates into the cranial and caudal rami — the future ACA and PCA, respectively. 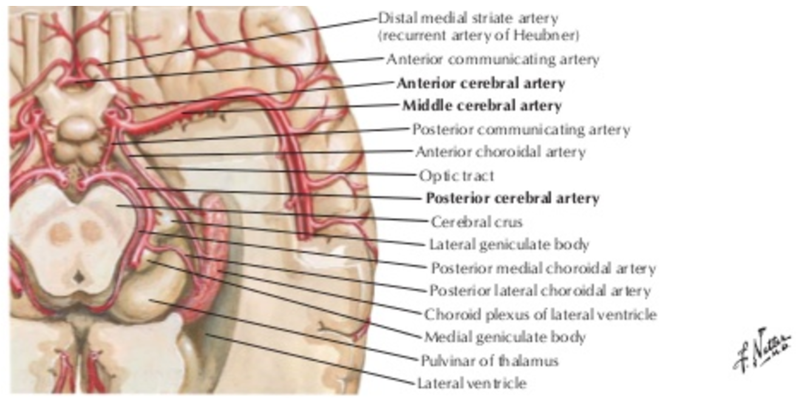 Transfer of the PCA territory to the vertebrobasular circulation is a process which seems to be necessitated, from the phylognenetic standpoint, by the relatively large volume of brain supplied in the human and other “higher species” by the carotid system. In many mammals the vertebrobasilar system does not prominently figure in PCA supply, being confined to the brainstem and cerebellum. 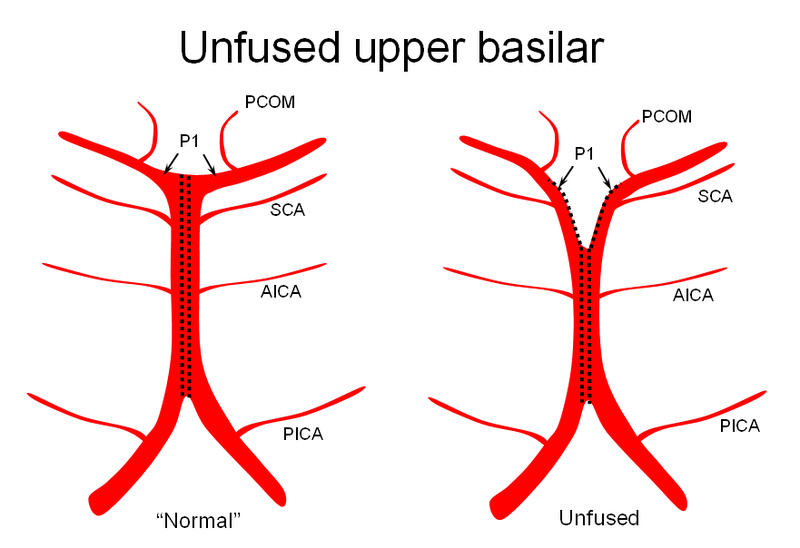 This is the simple phylogenetic explanation for the most common circle of Willis variant — the “fetal” PCA — named as such when early “fetal” arrangement of PCA origin from the ICA persists in the adult form, which is about 20-25% of the time. The variability in number is due to haggling over the semantics of what exactly constitutes a “fetal” PCA. Is it “complete” absence of the P1 segment of the PCA? Is it a state where P1 is felt to be insufficient to provide adequate PCA perfusion should the PCOM be closed? Is it simply when the PCOM is larger than the P1? Whatever the case, you have every right to confidently pick your own definition. The important point to appreciate is that there is no such thing as an “absent” PCOM or P1. 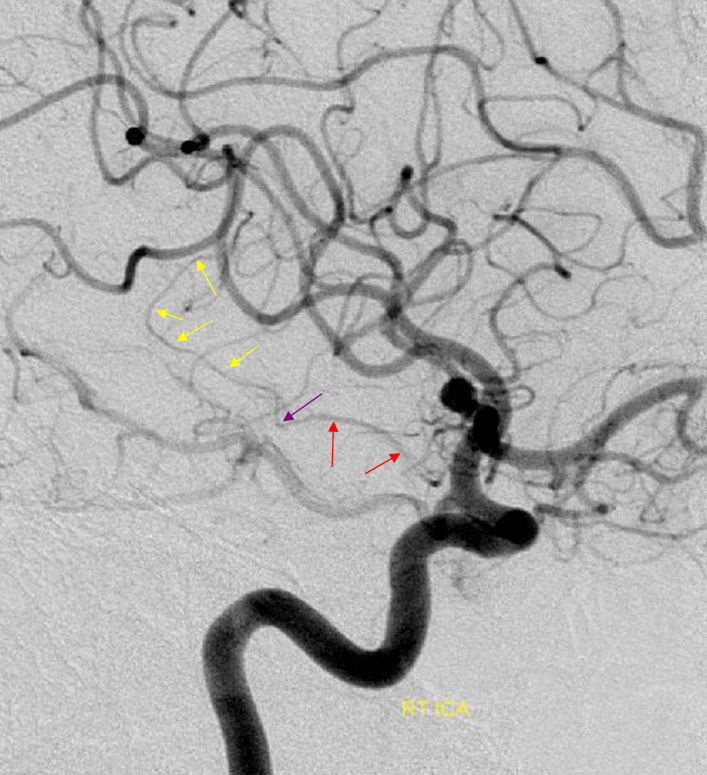 There is certainly an angiographic or MRA or CTA absence of these vessels, which means nothing except that your equipment is not good enough to see it. They are always present in fact, as embryologically required. 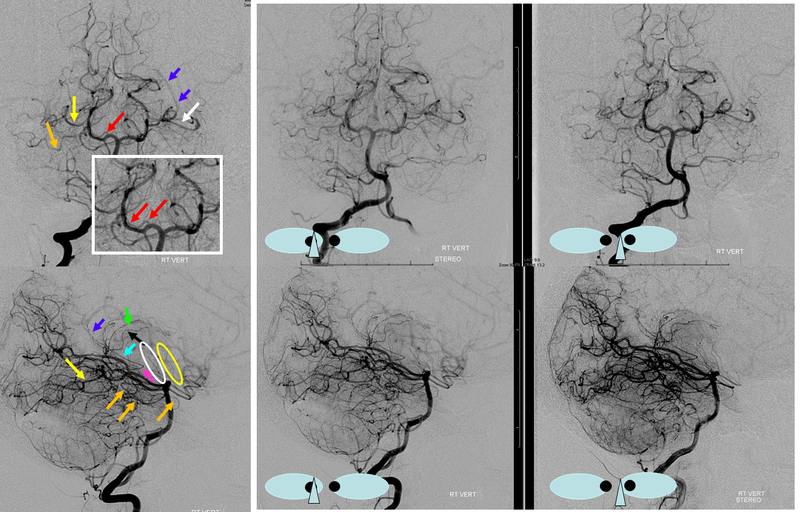 Early development of the PCA is dominated by its supply of the lateral and third ventricular choroidal territory (the choroidal stage, as best described in Surgical Neuroangiography), together with the Anterior Choroidal Artery. 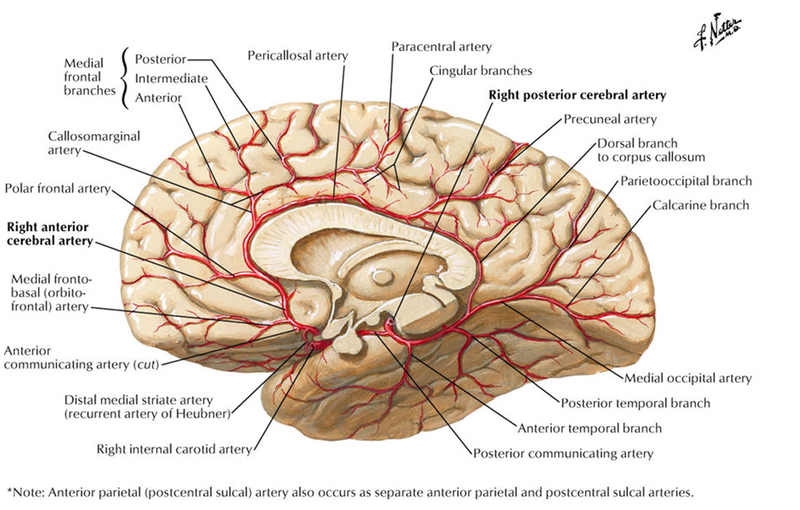 In fact, from a phylogenetic standpoint, it is the Anterior Choroidal and not the PCA that serves as the artery to the occipital and temporal lobar areas. 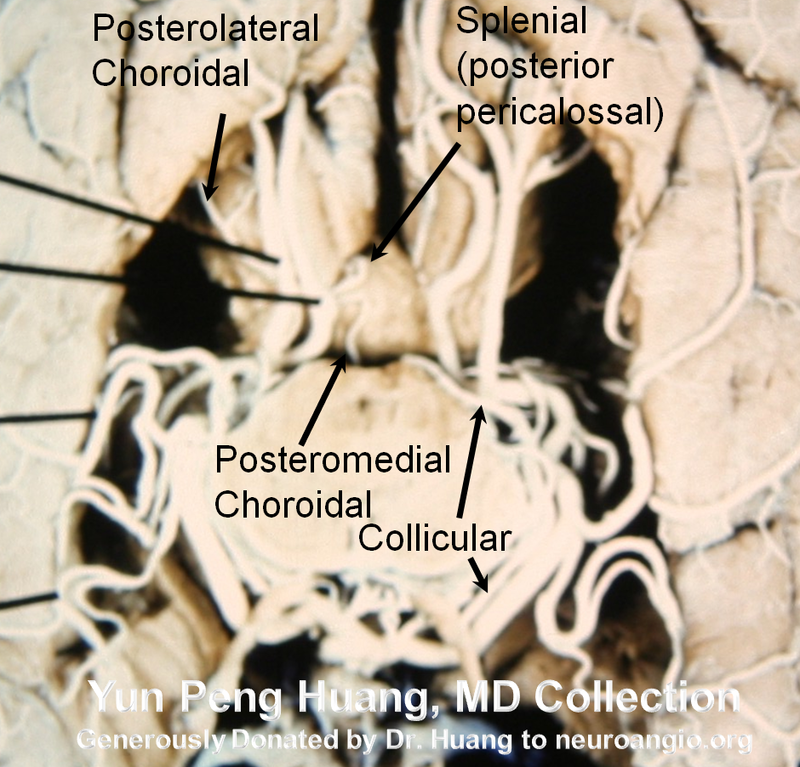 In the human, the Anterior Choroidal parenchymal supply is typically restricted to its segment proximal to its plexal point (again see dedicated page for details), with hemispheric territory transferred to the PCA. However, on occasion the anterior choroidal retains some of its formerly extensive cortical possessions, and as such might even be mistaken for a fetal PCA. In the vast majority of cases, however, the PCA is responsible for the supply of the mesial Occipital, inferomesial Parietal, and inferior Temporal lobes, as well as the choroid plexus of the lateral (together with the anterior choroidal) and third ventricles. Importantly, it also contributes to the supply of the cerebral peduncles and the collicular plate, its phylogenetically older territories. 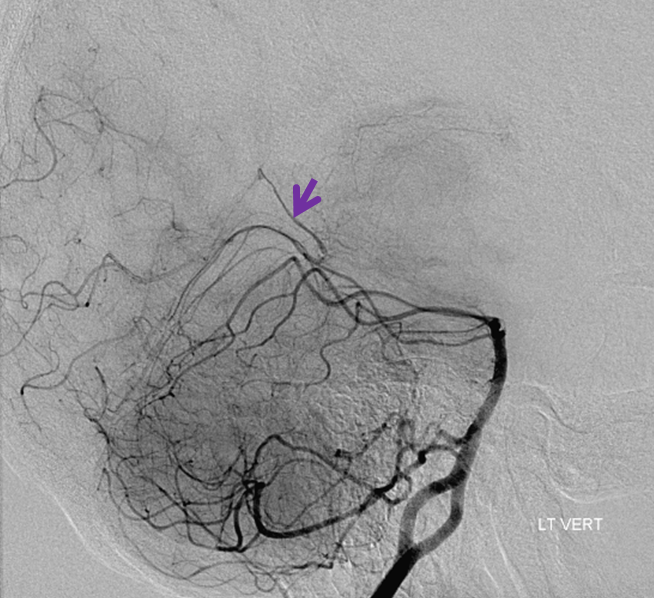 Below is a typical angiographic image of the PCA. 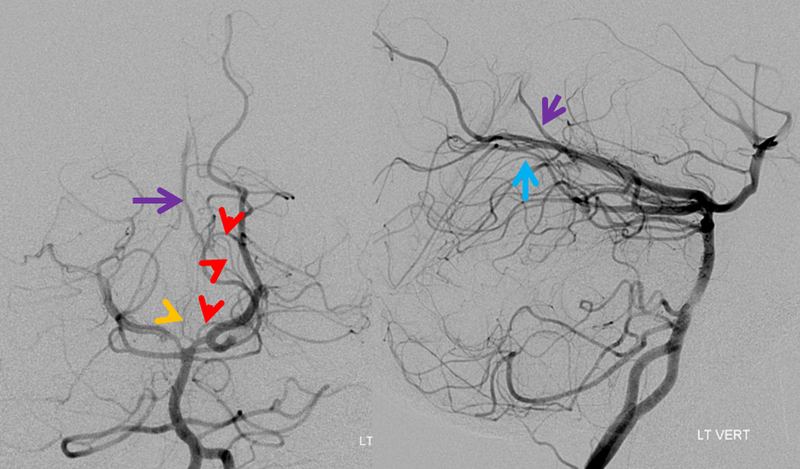 On the right, the P1 (purple) segment is smaller than on the left (red), with streaming of unopacified blood (white) through the right PCOM visible distal to its otherwise invisible confluence with the P1 segment. A typical “fetal PCOM”, ICA injection. 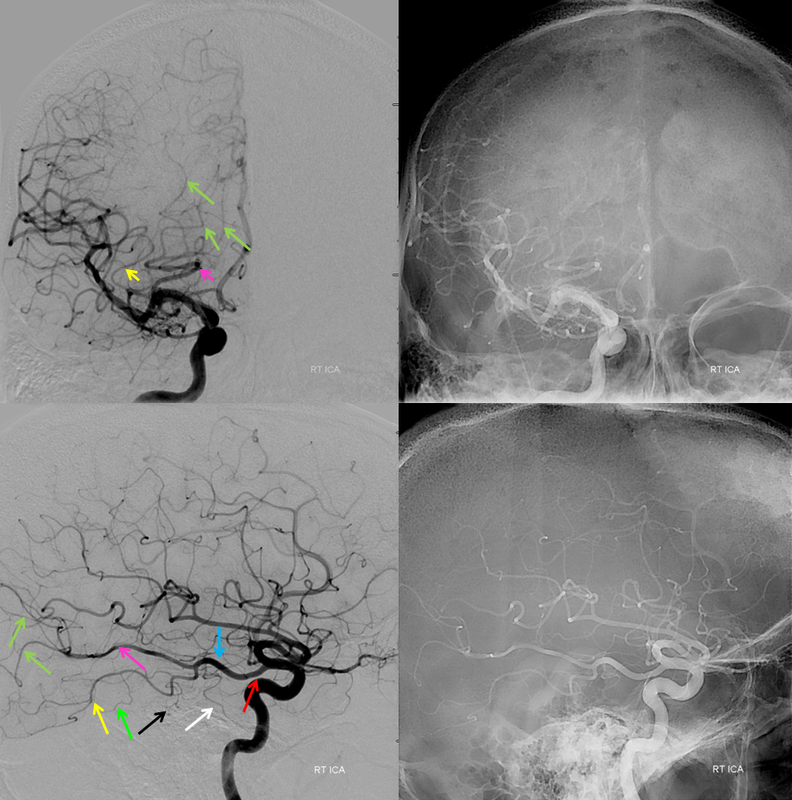 Various branches of the PCA are marked, including PCOM (red) and posterior inferior temporal (yellow, green), middle temporal (black) and anterior temporal (white) branches arising from a common trunk, with the posterior temporal one being the largest. There is tremendous variation in how the inferior temporal branches are organized. The important part to understand is where the branch is relation to the brain. Left vertebral injection in the same patient. Notice a steeper “Townes” frontal projection, as compared with the standard AP above. 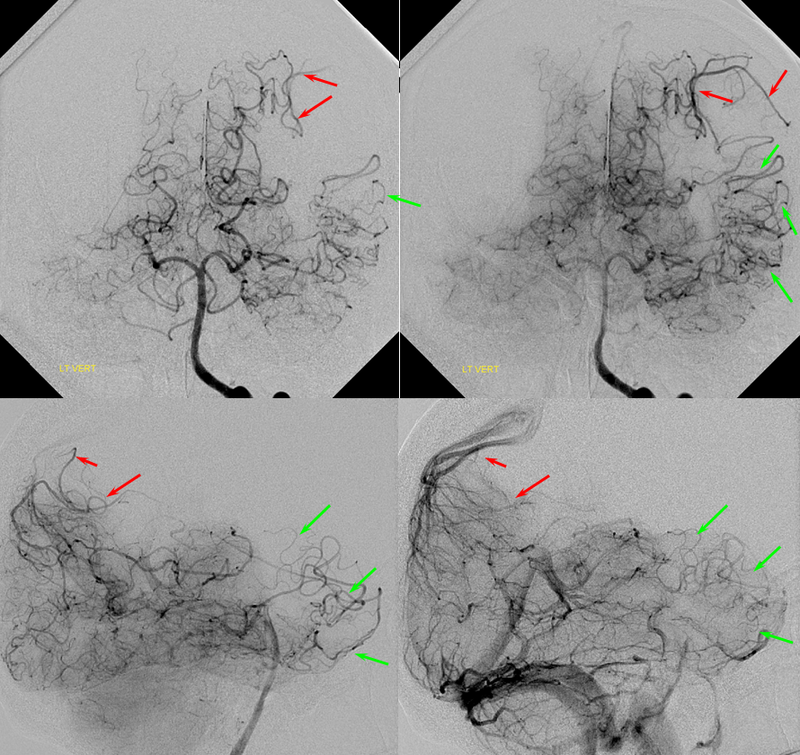 The right P1 is “absent”, but only angiographically. The left PCOM (red) is transiently retrogradely opacified by the force of the injection. The portion which curves around the brainstem is the “P2”. Anything distal is P3, P4, and on. Because of the fetal disposition on the right, the lateral allows for left PCA view without superimposition. The all-important calcarine branch (black) is the paramedian branch just above the tent (where the calcarine cortex is). Importantly, it will be foreshortened in the Townes view because the tent will be sloping down. The parieto-occipital branch on the other hand (pink) is less foreshortened. It is typically large and should not be mistaken for the calcarine one. 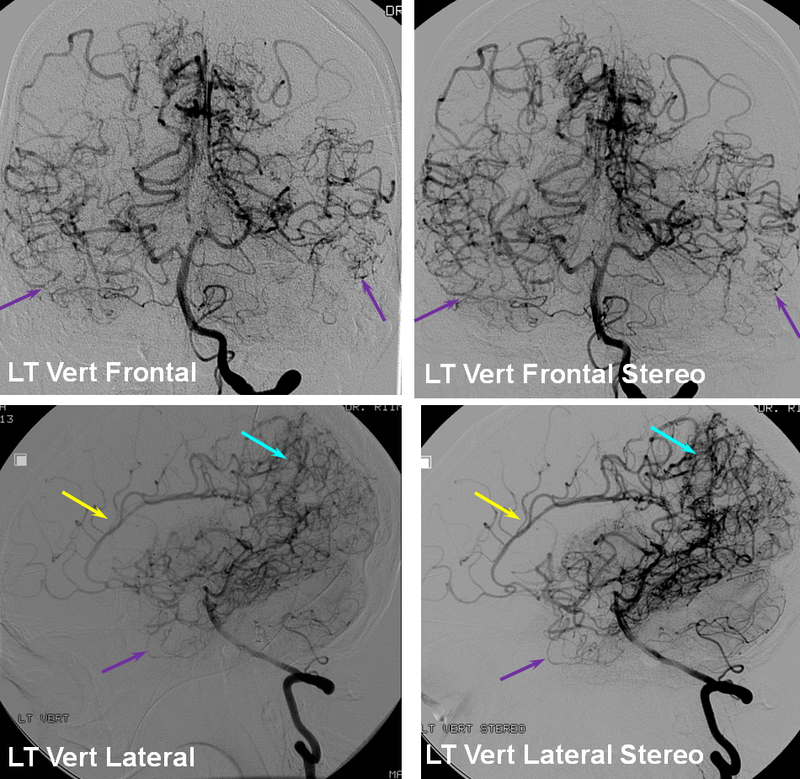 Also notice several large posterior inferior temporal branches (yellow). Because of the shape of the tent, which slopes down as it stretches laterally, the temporal branches will ovelap the cerebellum in both frontal and lateral views. It is very important to understand that. 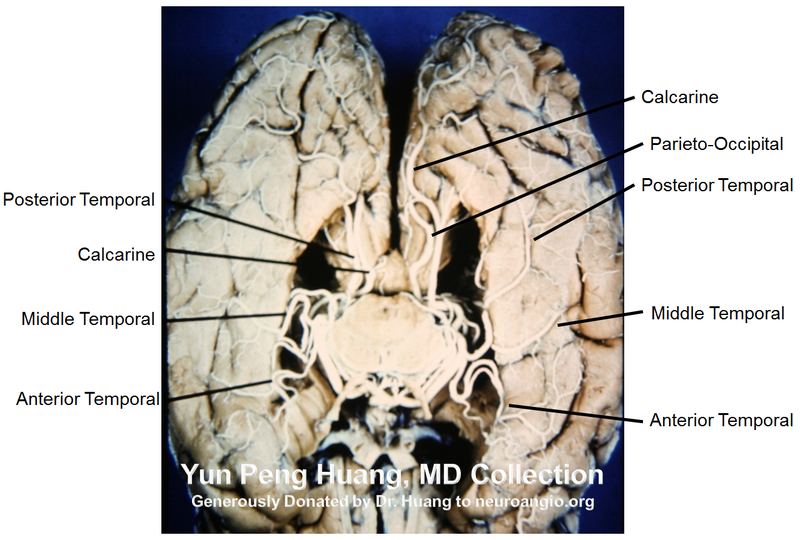 The calcarine branch will never do that in the lateral view, because the medial occipital lobe is always above the cerebellum. Another fetal PCOM (by my definition), on the left. A small P1 segment is present (orange). Notice how well the left tent is outlined by the hemspheric branch of the left SCA plastered up against it (no arrows this time). A sizable basilar fenestration is shown by the brown arrow. Also note that the frontal left vertebral injection projection is not a Townes, but more like a Caldwell/Submental type. 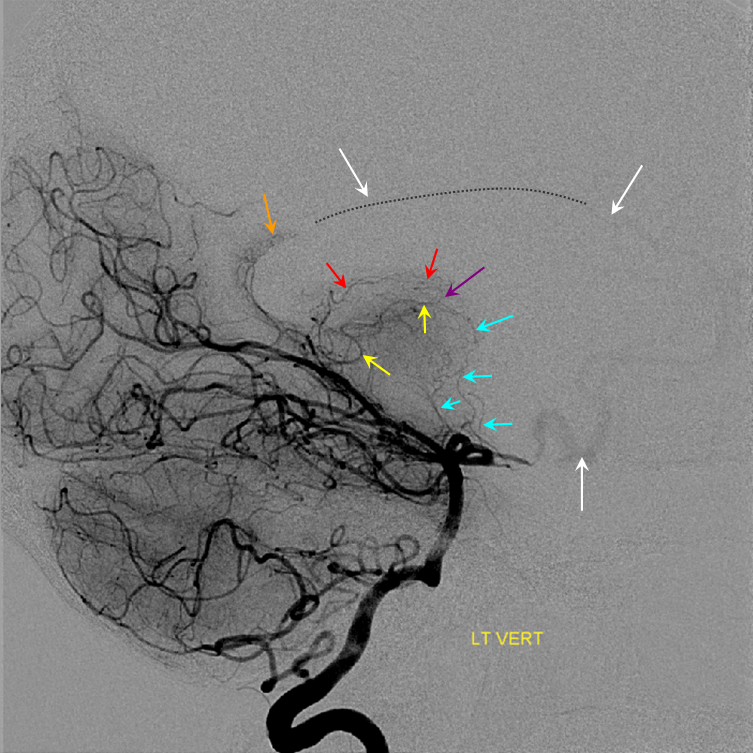 Thus, all PCA branches are superimposed on each other, with no good definition, except for one — the posterior lateral choroidal branch (white arrow) rises above the rest, to where the lateral ventricle would be. Posterior Communicating Artery Fenestration — not something you see everyday. Here is one, in association with a Trigeminal artery. So, what does that say about the embryology of the PCOM as a caudal ramus of the ICA? The following variation, involving lack of basilar tip fusion, can generate a lot of confusion. 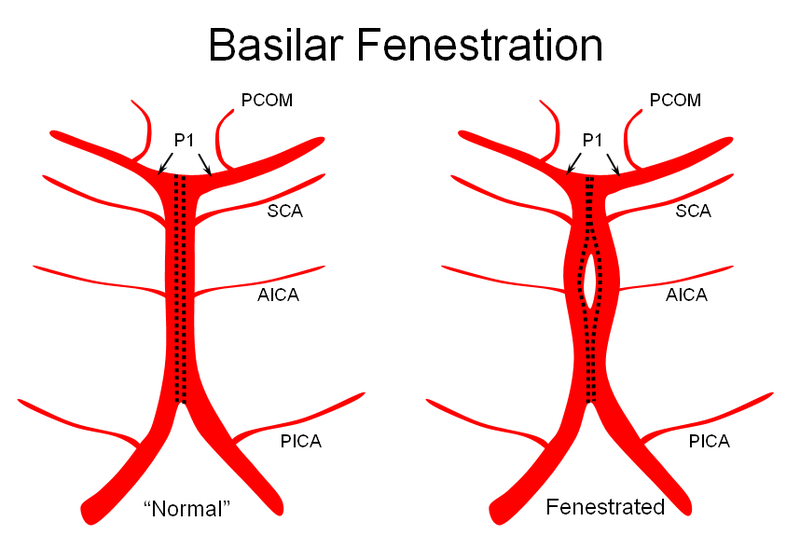 Effectively, the top of the basilar is split in two, so that one or both superior cerebellar arteries originate from the P1 segment. 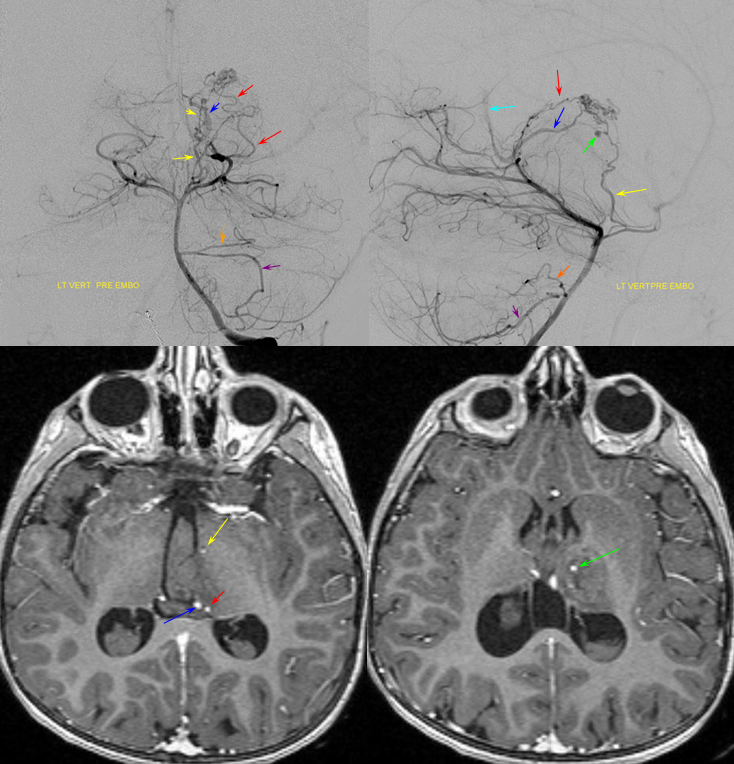 This variant is not, therefore, a primary superior cerebellar artery aberration, but instead a deficiency in basilar fusion. 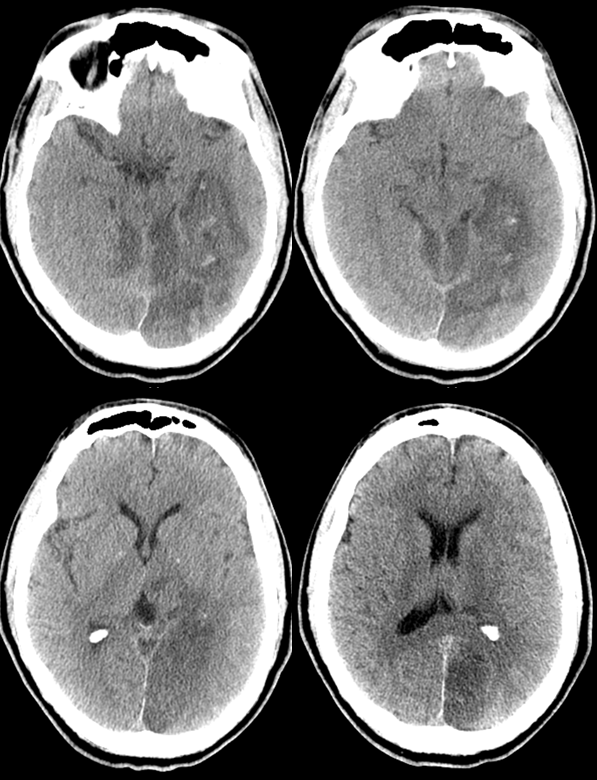 The third, basilar fenestration, is quite common, and usually of little clinical significance, except when it is so short as to minic a dissection. Basilar nonfusion — extreme fenestration, a completely “unzipped” look. Very rare. 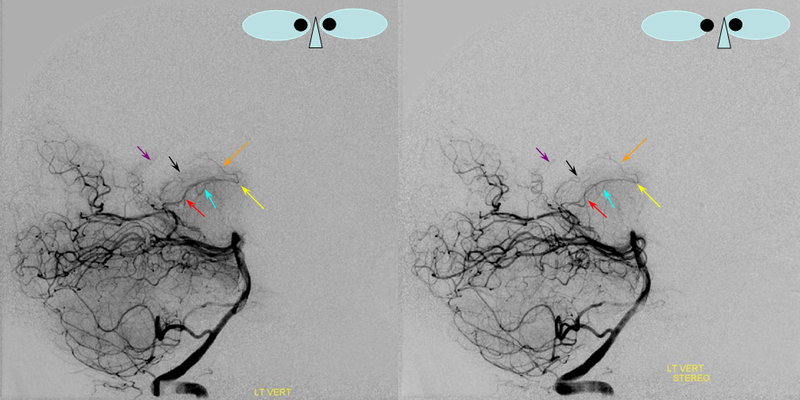 The same unfused upper basilar, with the seemingly opposite appearance of the right P1 (red arrow) originating from the SCA. 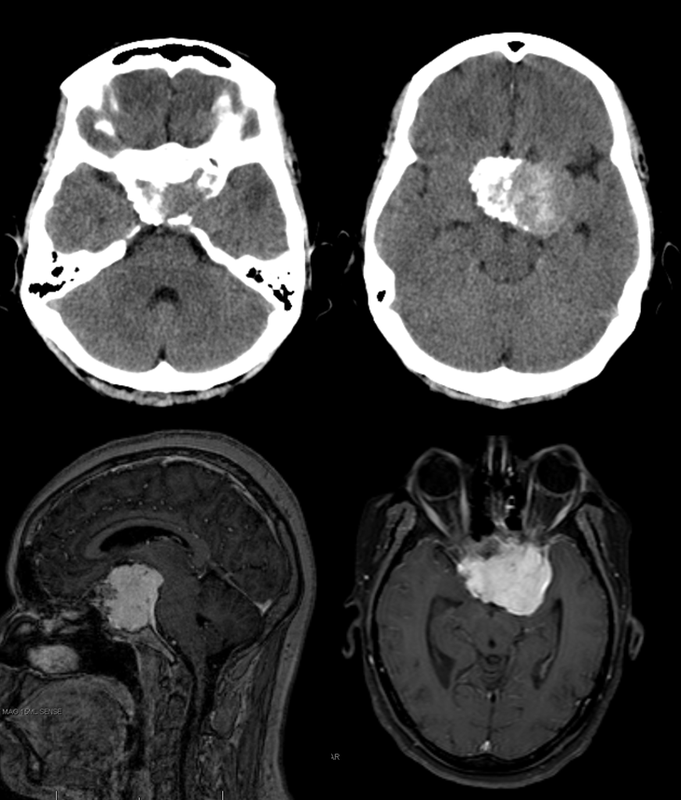 Both cases are in fact variants of deficient upper basilar fusion. 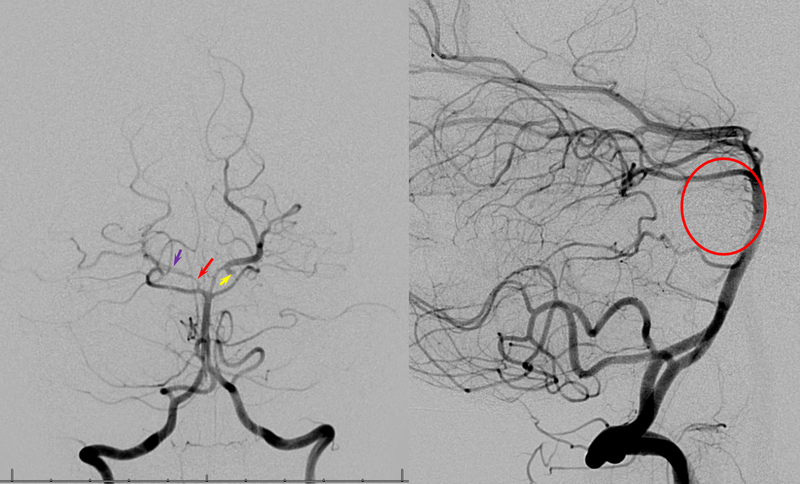 P2 wash-in (purple) is present, as well as some reflux into a dominant left PCOM (yellow). 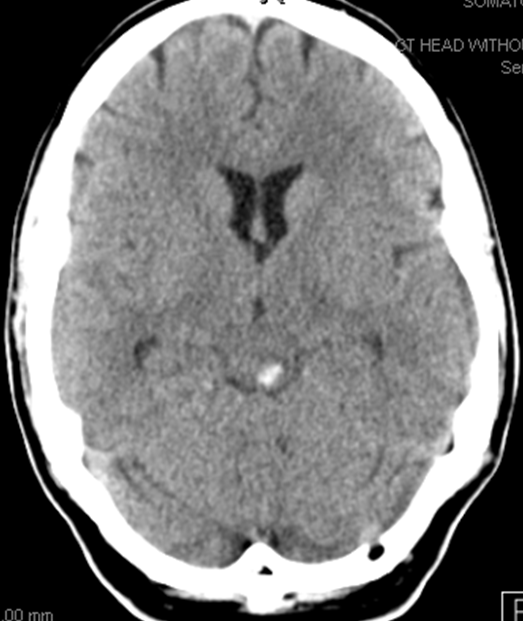 Notice abundant pontine perforators (within red oval) in setting of bilateral PICA dominance. The smaller the AICAs, the more perforators will be. 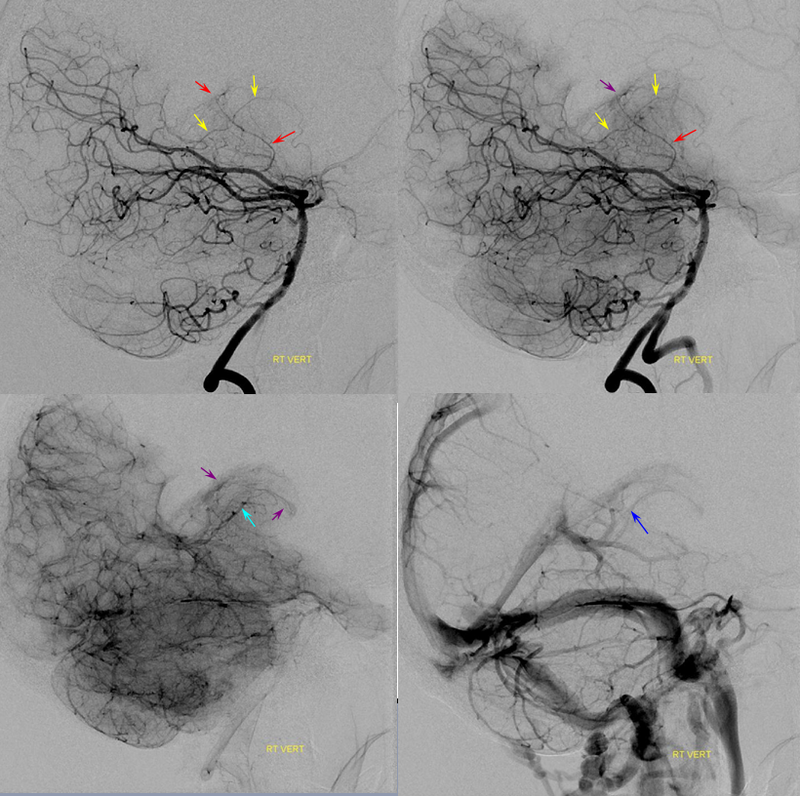 For more details, see Basilar Artery page. 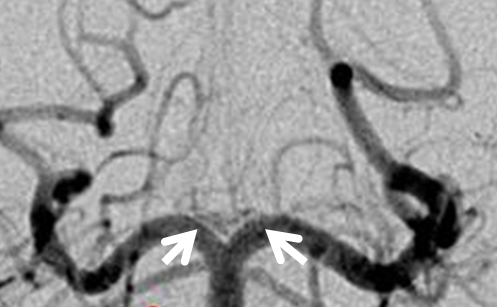 Below is an example of an embolus from the carotid artery into a fetal PCOM (white arrow). 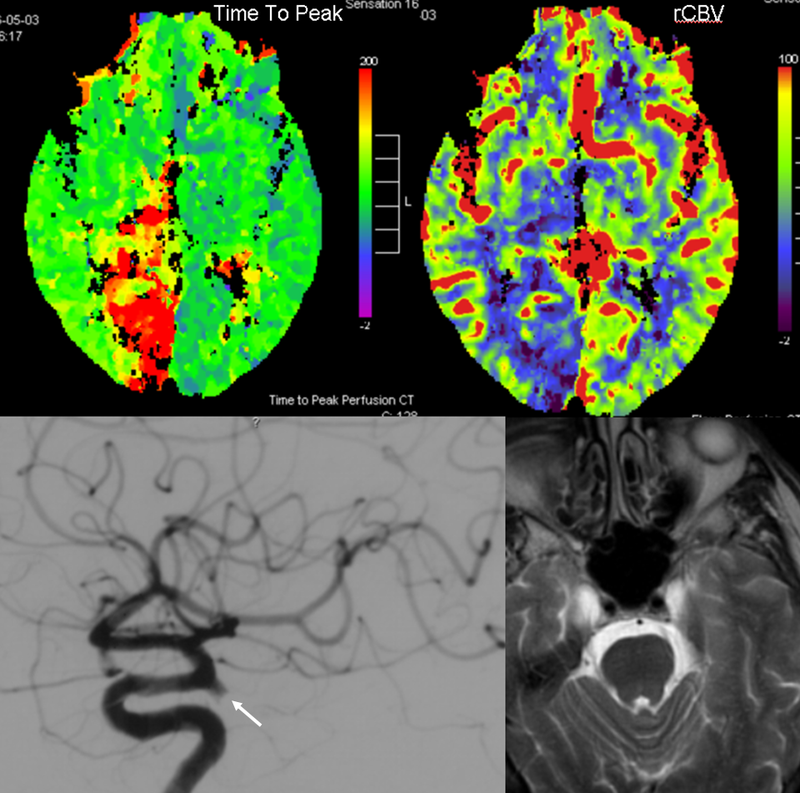 Notice markedly reduced CBV values on this CT perfusion map, indicative of a “completed” infarction with no penumbra. This, unfortunately, is too often true with occipital infarcts. The medial occipital area is not well-supported via leptomeningeal collaterals, being at the distal end of both ACA and MCA territories, and cortical visual field deficits too often show minimal to no recovery. Also appreciate the relatively “straight” shot from the supraclinoid ICA into the PCOM, suggesting that this was the hemodynamically preferable route for the embolus. Frank Netter drawing, emphasizing inferior location of the Calcarine branch in relation to the Parietooccipital branch which is situated in the sulcus of the same name. 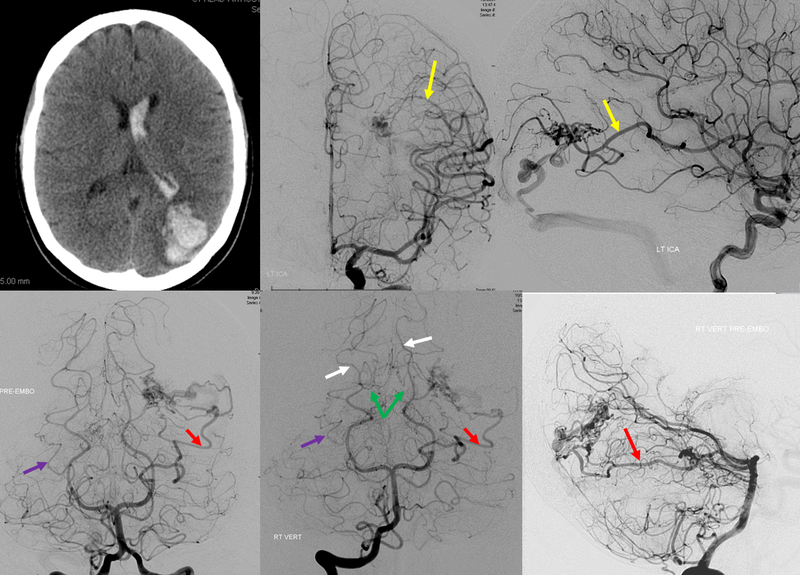 The PCA can be very effective in leptomeningeal collateralization of the MCA and even ACA territories. The inferior temporal branches (green) will attempt to reconstitute the upper, perisylvian portions of the temporal lobe, while the parieto-occipital branch fills in variable territories of the superior parietal lobule, precuneus, and possibly the posterior frontal convexity, depending on whether or not the hemodynamic constraint affects the MCA, ACA, or both. 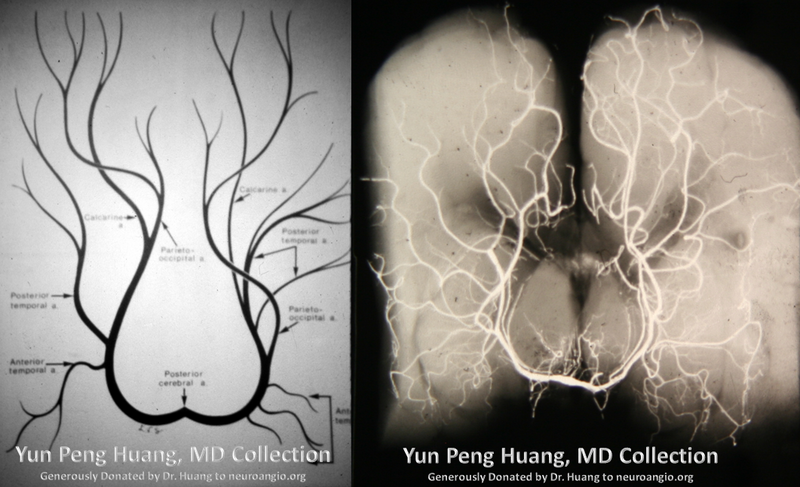 In this way, the inferior temporal branches can help salvage the Wernicke area. 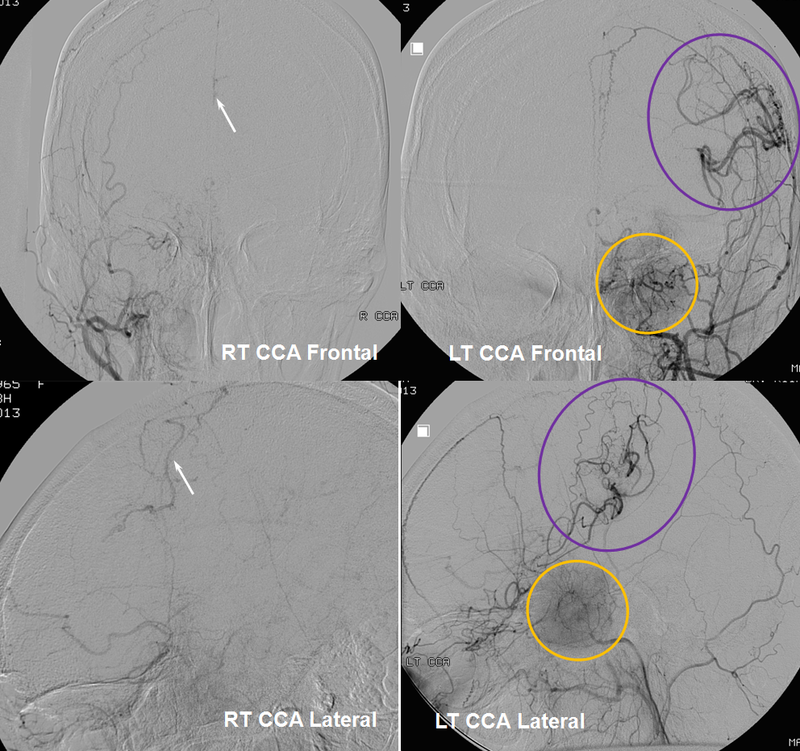 In most cases of acute occlusion, however, PCA cortical branches are too far posterior and inferior to effectively resupply the frontal lobe, which depends on the ACA in cases of insufficient MCA perfusion. 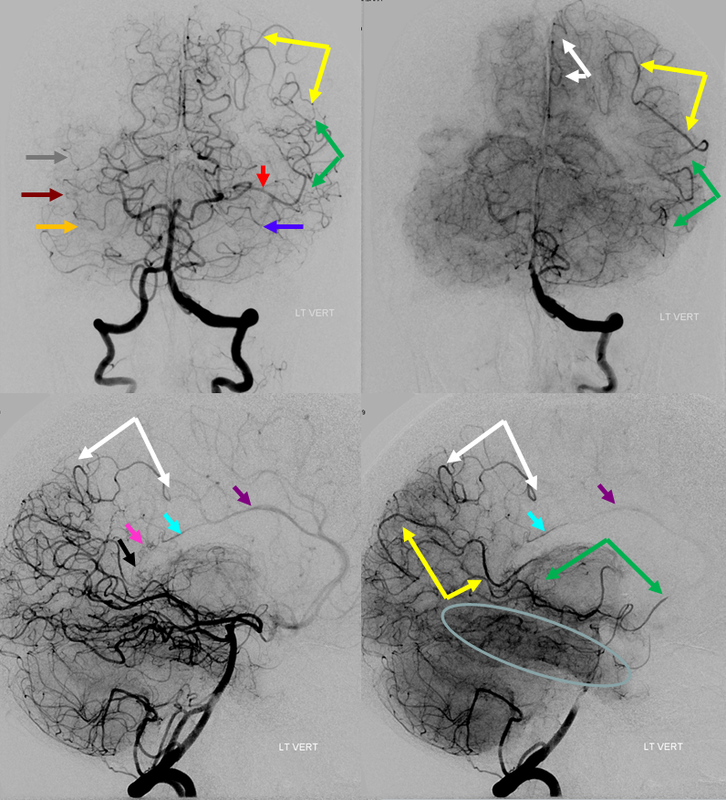 In this ICA embolus case, the posterior inferior temporal branch (red) and middle inferior temporal branch (purple) leptomeningeal vessels help reconstitute a sizable portion of the temporal lobe (light blue oval, parenchymal phase), retrogradely opacifying several inferior division temporal (green) and inferior parietal (yellow) branches of the MCA. 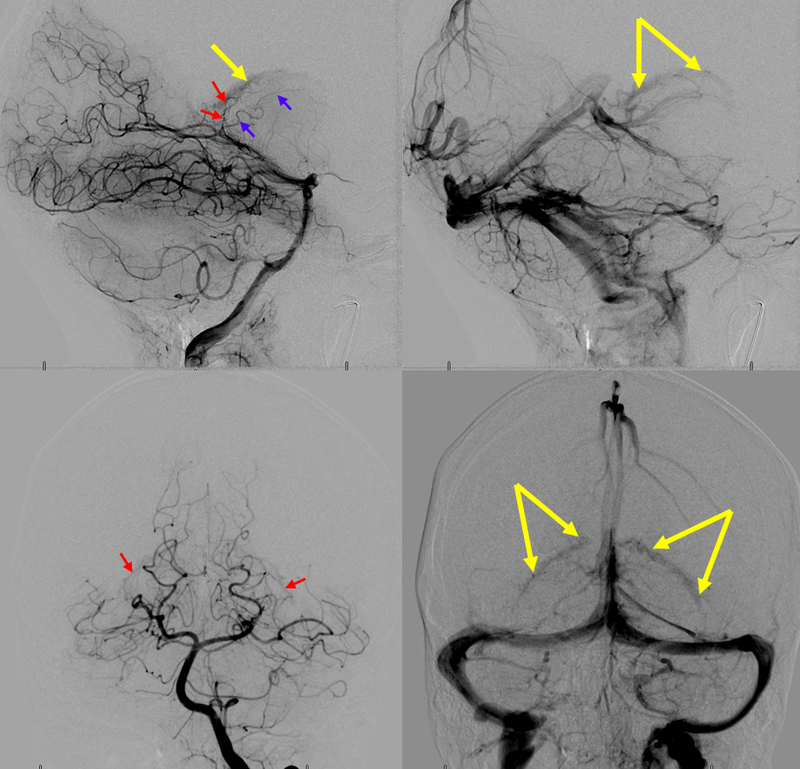 The parieto-occipital artery attemps to revascularise the cuneus, reconsituting a superior mesial parietal branch (white) of the ACA (purple arrow). The extent of collateral support in the temporal lobe territory is fairly robust. 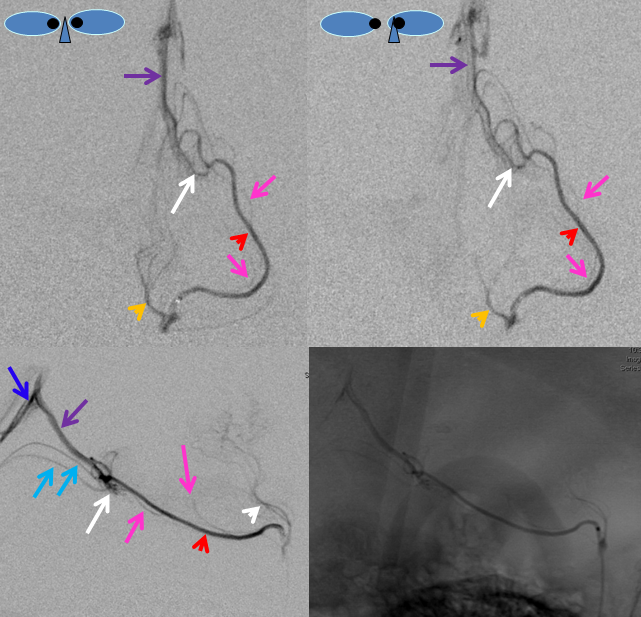 The posterior pericalossal artery (black arrow) is normally a very poor collateral to the distal pericalossal (light blue) territory of the ACA. In this case, a small leptomeningeal network (pink) is trying its best. 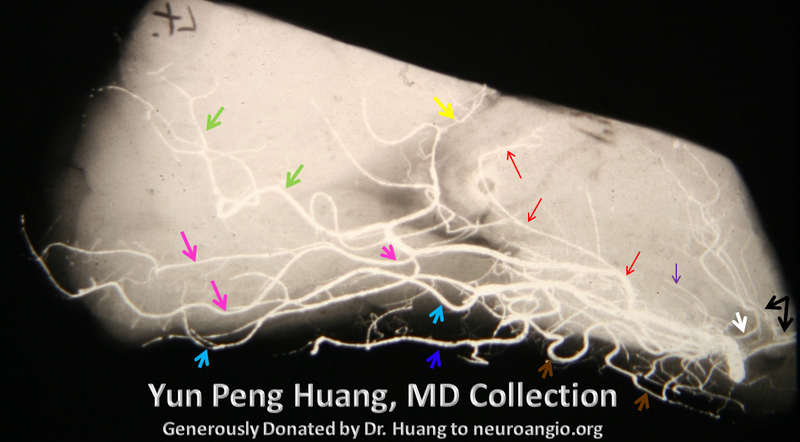 Notice normal-appearing posterior (gray), middle (brown) and anterior (orange) inferior temporal branches on the right. Here is another example of rather effective leptomeningeal collateral response through the parieto-occipital territory supporting the superior parietal lobule (red) and great inferior temporal support of the MCA inferior division (green). Nearly the entire temporal lobe is adequately perfused. 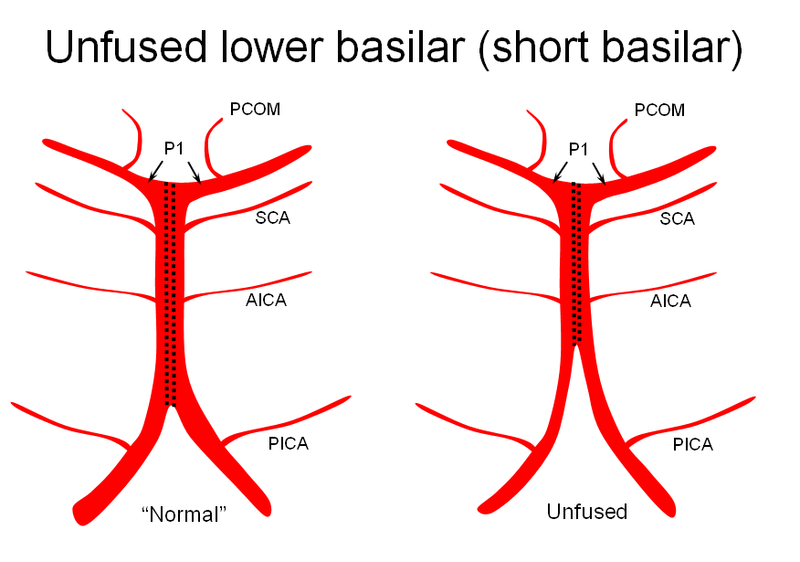 As mentioned above, in the acute setting the connection between the posterior pericalossal branch of the PCA and the distal pericalossal branch of the ACA is rather inadequate for meaningful reperfusion of either vessel by the other. However, any slowly progressive constraint is another matter. 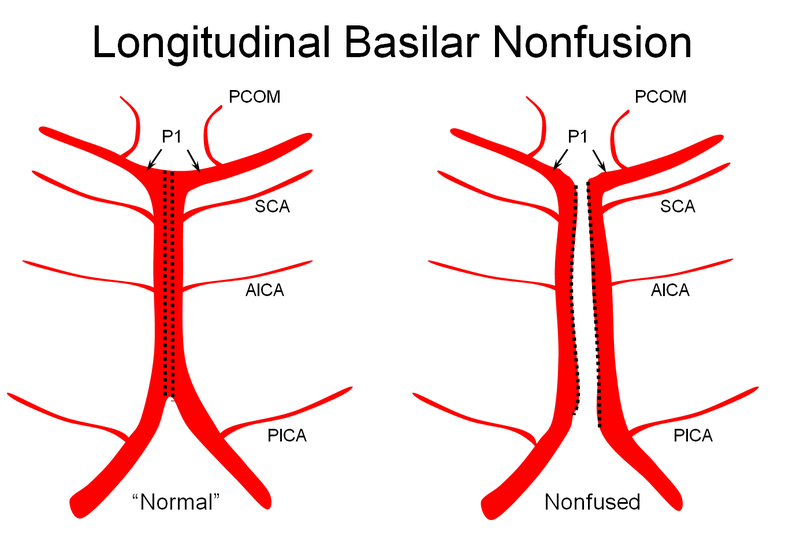 The typical scenario is Moya-Moya, where very proximal bilateral MCA and ACA constraint calls the PCA into action. However, it need not be Moya-Moya — any slowly evolving process will do. 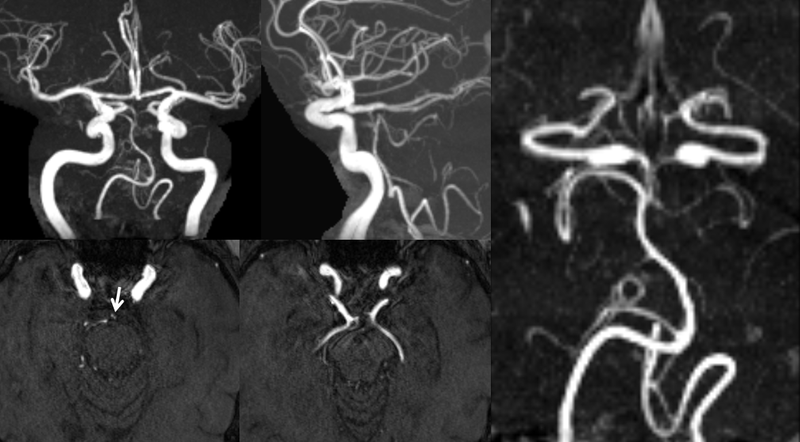 At least on some occasions the Collicular artery can be resolved, both with MRA and angiography. 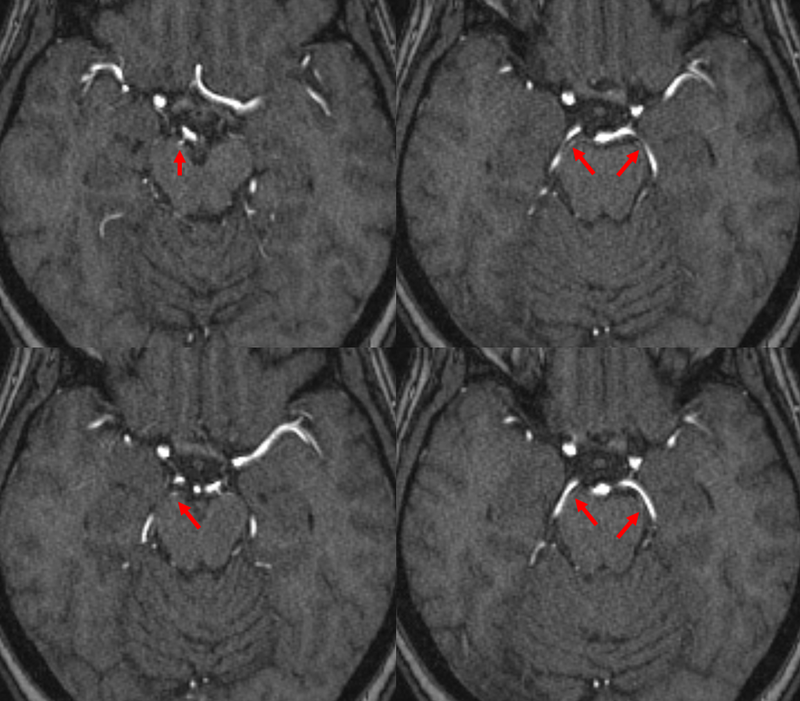 Here is an example of one (red arrows), located just medial to the P2 segment. 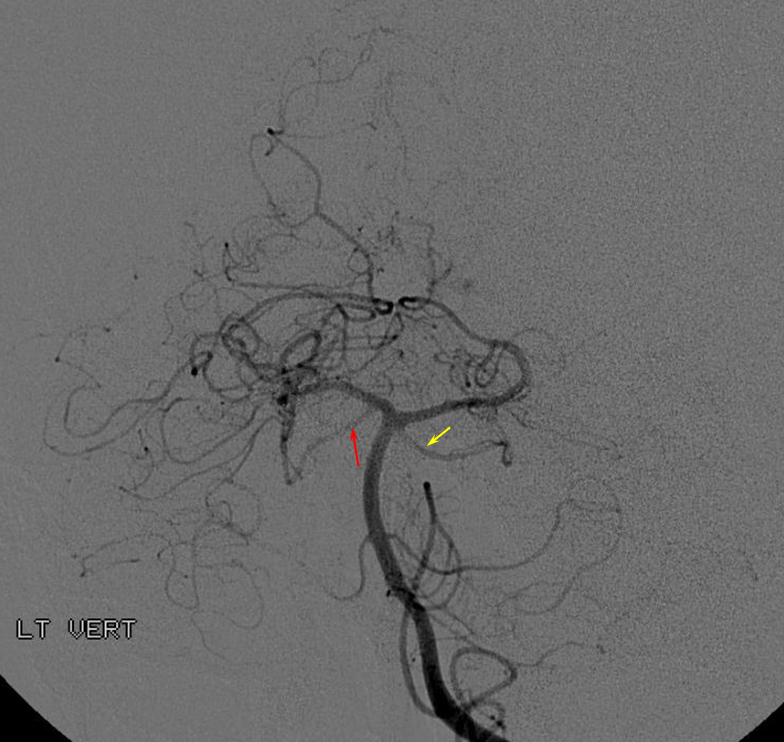 Here is an MRA of a different patient, with the same artery seen bilaterally. Could this be the posteromedial choroidal artery instead? Certainly. That’s what Netter would say. 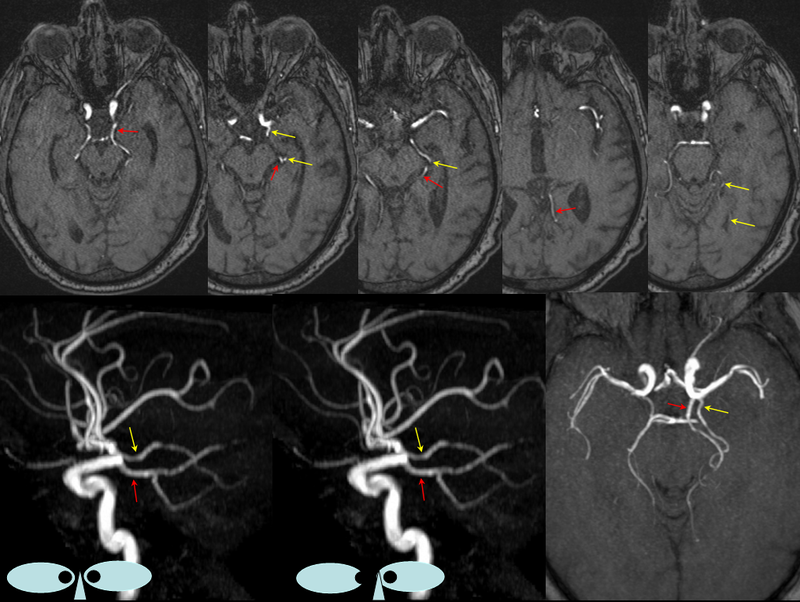 3D-DSA angiographic views demonstrating the relationship of the Collicular artery (red) to the much larger P2 segment of the PCA. 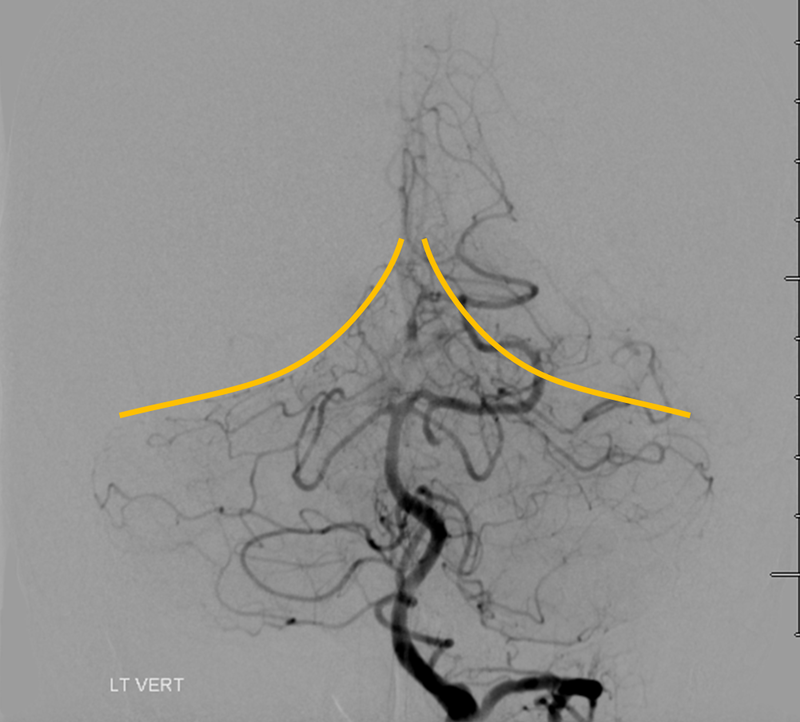 Even in its AVM-related enlarged state, the Collicular artery remains slender and difficult to differentiate from the P2 segment on nonselective vertebral angiography. No wonder it is so often missing from descriptions. 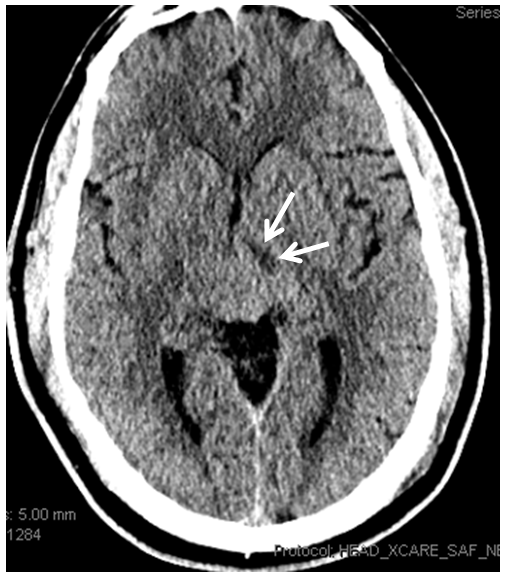 I hope that this case, and the image of the stroke, are convincing enough. Below is another example of the Percheron (white), a detail from one of the images shown above. The hypoplastic left P1 is orange. – the atrium of the lateral ventricle is located above the third ventricle. 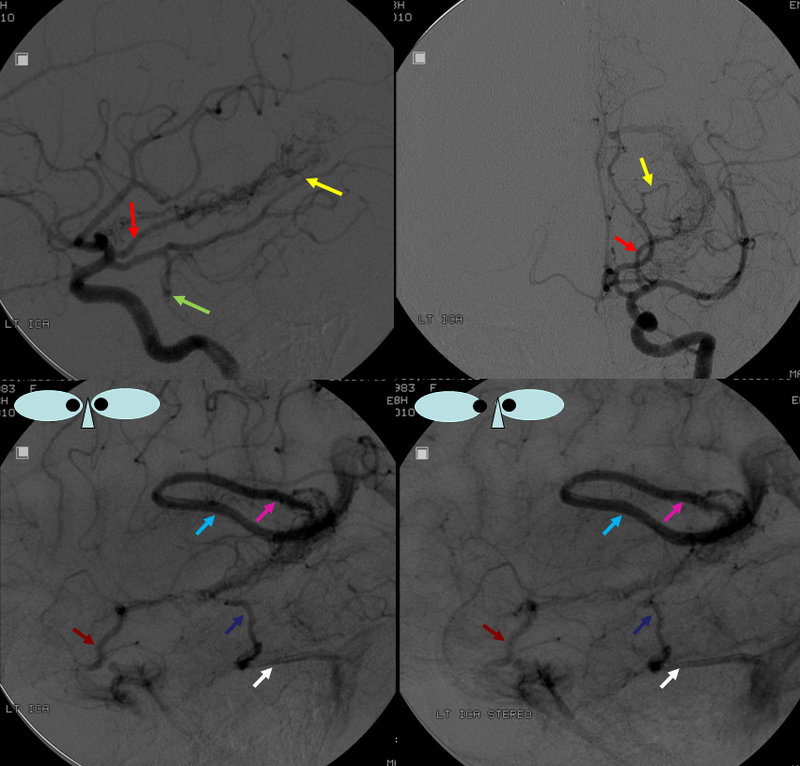 Therefore, the lateral choroidal artery (red) will be situated above the medial choroidal (purple) on lateral views. Notice, in this case, the relatively intense and persistent staining of the lateral ventricular choroid plexus (yellow), well into the late venous phase. In isolation, it is of no clinical significance. Dominant posterior medial choroidal artery. All pericalossal arteries are in hemodynamic balance. 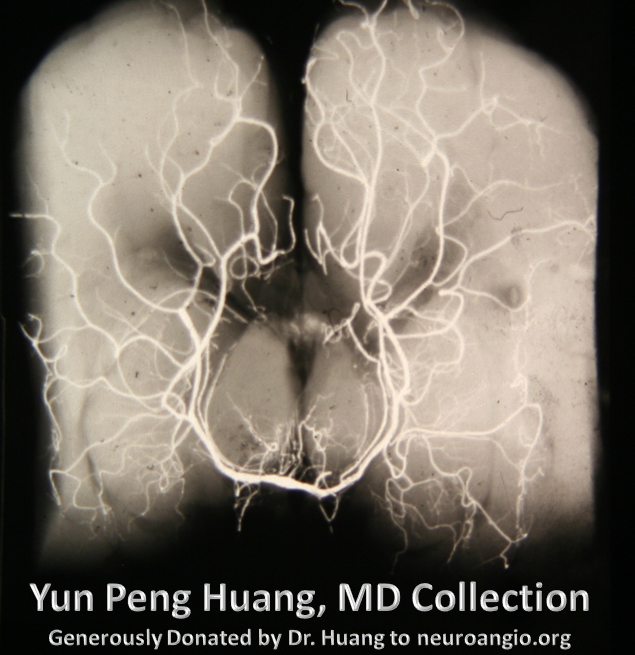 The balance between posterior medial and lateral choroidal arteries can be shifted in either direction. The dominant vessel traverses the foramen of Monro to supply the choroid plexus of the correspondingly hypoplastic feeder. 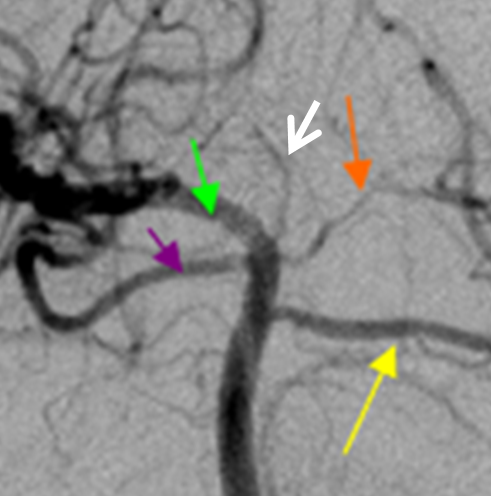 In this example, the medial choroidal (red) is dominant and extends superolaterally across the foramen of Monro point (yellow) to supply the lateral ventricular territory (orange). 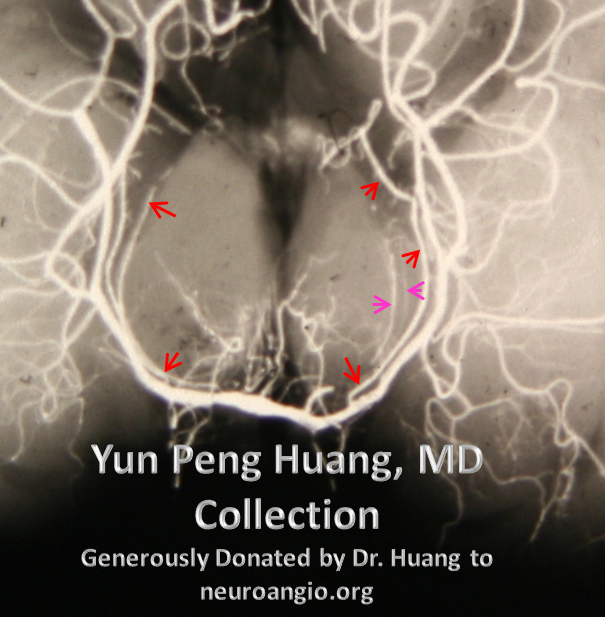 A hypoplastic lateral choroidal artery (black) is present. The splenial arteries are labeled in purple.